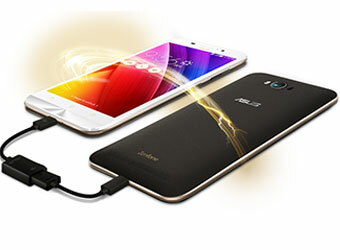 Taiwanese handset maker Asus has bumped up the internal storage of its ZenFone Max handset and added a faster processor in a new exclusive edition for India. The new edition, launched on Monday, runs on the latest Android Marshmallow 6.1 operating system, instead of the Lollipop 5.0. But there has been no change in the design and the handset comes with the same textured finished back cover. It is available in four colour choices—Orange, Blue, White and Black. The company has replaced the Snapdragon 410 quad-core processor with the Snapdragon 615 octa-core processor clocked at 1.5GHz. The internal storage has been increased to 32GB from 16GB. The handset comes in two variants, with 2GB and 3GB of RAM. Both versions support external storage up to 64GB via a micro-SD card. The phone, which was first introduced earlier this year, comes with a mammoth 5,000mAh battery—its claim to fame. It features a 5.5-inch IPS display with 1280 x 720 resolution. It supports a 13-MP rear camera, with laser auto-focus technology and an aperture of f/2.0, and a 5-megapixel front camera. The laser auto-focus technology claims to focus on an object in 0.03 seconds. Another interesting feature is that the handset comes with OTG (on-the-go) support, meaning the phone can be used as a power bank to charge another device. The 2GB version of the phone is priced at Rs 9,999 while the 3GB variant is priced at Rs 12,000 and is available for pre-order on leading e-commerce portals. Asus has also announced Zenvolution on May 31 where it is expected to launch the new ZenFone 3 series. The ZenFone Max competes with the likes of Xiaomi's Redmi Note 3, Lenovo's Vibe series of handsets, Motorola's Moto G and LeEco's Le 1S, among others. South Korean firm Samsung leads India's smartphone market with a 26.6% share in January-March 2016, according to data provider IDC. Micromax with 12.6%, Intex with 9.2% and China's Lenovo along with unit Motorola with 8.2% share are the other major players.